Perhaps it was because a dear friend and parishioner died yesterday. Or maybe it was because this is my tenth General Convention. I have attended several legislative sessions at the last General Convention in Indianapolis, but this was the first time I ever stood to speak. Presiding Bishop Katharine Jefferts Schori, in the first of her several valedictories at this General Convention, was passionate and compelling. As a church, she said, we are finding our edgy DNA. We are discovering God working in places we failed to look at before. And that we need a "next generation operations manual." While the Bishop and Deputies were attending their respective orientations this morning, I took my camera to Temple Square, the 10-acre complex owned by The Church of Jesus Christ of Latter-day Saints, just one block from the convention center. Today at the 78th General Convention of The Episcopal church a joint session of Deputies and Bishops got a firsthand introduction to the four candidates who are standing for election for Presiding Bishop. The man (and all four candidates are men) who is elected will serve for nine years or until they reach age 72. Today was the day of orientation as an alternate deputy. The tradition at General Convention is to decorate the stanchion (the pole that indicates your diocese) in some way that represents your location. Our deputation racked our brains trying to figure out what we are going to use to say "Newark is here!!!" And behold... our fabulous "Bridgegate" created by Cynthia Black. This morning was a joint session of the House of Deputies and the House of Bishops, and it was the first time our entire deputation was together. 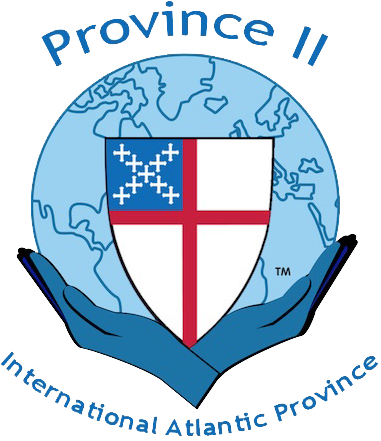 The Diocese of Newark contingent has been arriving in Salt Lake City yesterday and today for the 78th General Convention. Today we've been getting registered, finding our way around the convention complex as well as downtown Salt Lake CIty, and generally preparing for the 10 days ahead.